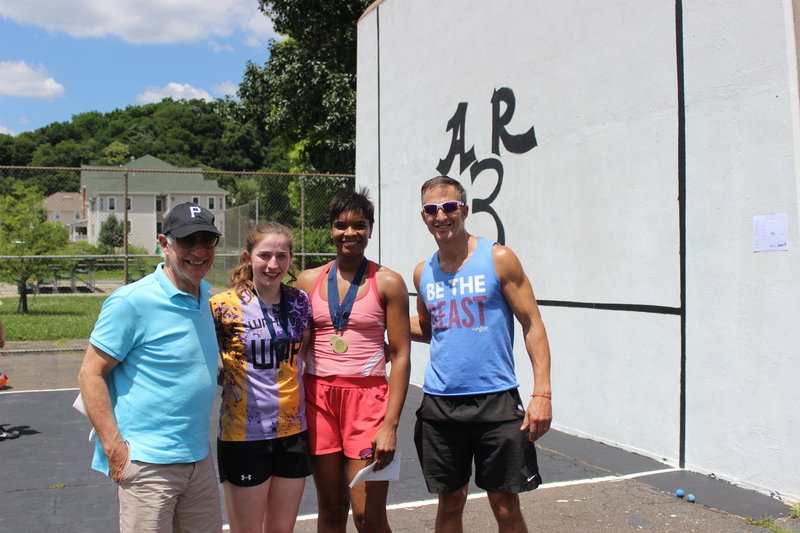 Pittsburgh, PA, WPH Press, 7/9/17- The ninth edition of the WPH’s Rodney Fink Classic featured nine men’s and women’s Race 4 Eight pros, with players traveling form six states and three countries to participate in one of handball’s best events. Players enjoyed the best hospitality in the sport, Women’s WPH Outdoor Xrossover singles, 4-Wall singles, 4-Wall mixed doubles, 1-Wall small ball singles and 1-Wall big ball singles. 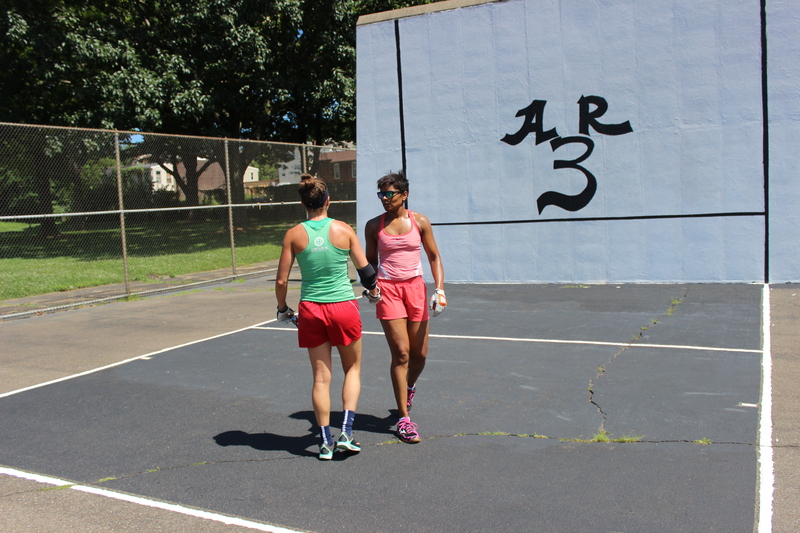 The WPH’s RFC 9 proudly featured the second Women’s WPH Outdoor event of the season, featuring a cross-over round robin 1-Wall small ball and big ball singles format with four of the game’s most dynamic women’s stars. WR48 U.S. #1 Tracy Davis made the trip from Southern California, WR48 #1 Catriona Casey made the trip from Ireland, WR48 rising star Suz Koehler traveled from Missouri and former WR48 finalist Jessica Gawley traveled from Canada to compete for valuable WPH Outdoor ranking points and the prestigious RFC title. 10-time national pro singles champion Tracy Davis cruised in her first two 1-Wall small ball round robin matches, while former WPH Outdoor Xrossover champion Catriona Casey also cruised in her two round robin matches to meet Davis for the title. Davis raced to a 9-1 lead in the one game match to 25, but Casey quickly cut the deficit to one at 10-11. “I think Tracy has only lost one 1-Wall small ball match in 15 years, maybe 25 years,” stated referee and outdoor star Billy O’Donnell. Davis never relinquished her lead, eventually leading 18-15 as the pair dazzled with sensational athleticism and tremendous shot making. Casey had a good opportunity to score the 16th point twice, missing a plum from just 10 feet from the wall on the first attempt and watching helplessly as Davis returned an angled serve with a better angle just out of Casey’s reach. Davis served out the match in her third inning at 18, taking the early lead in the quest for the RFC Xrossover title. 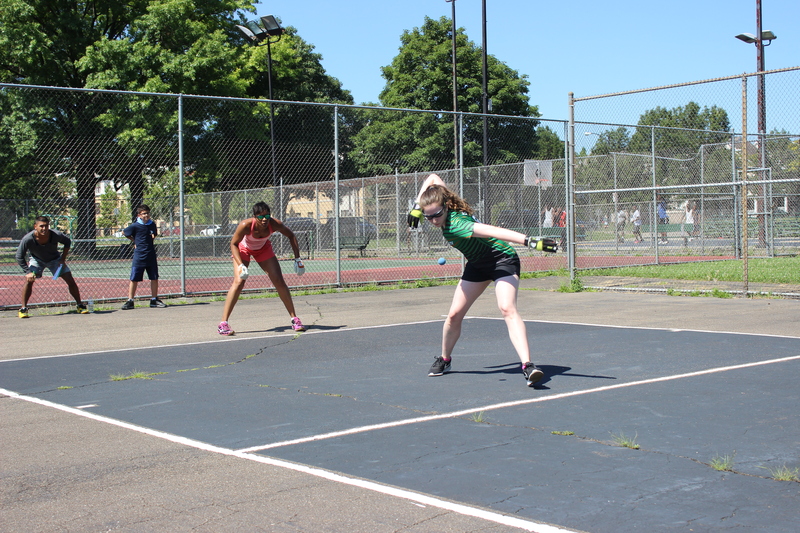 The women’s big ball singles played out in identical fashion, with both Davis and Casey winning their first two round robin matches, respectively, to play for the big ball title. Casey would need to win the big ball to have any chance at the title and she played with fearless aggression. Casey lost Davis 21-20 in 1-Wall big ball singles in their only previous encounter at the 2016 WPH Outdoor Xrossover, but would leave no doubt in the rematch, taking a 20-4 lead with power serves and fly kills. Casey would close out Davis 21-6, meaning the pair split first and second in the two Xrossover brackets. By virtue of scoring more combined points in the two brackets, Casey was given the choice of ball for the deciding 11-point tiebreaker and chose the big ball. The RFC’s 4-Wall singles featured the largest draw in the nine-year history of the event, with 38 players ranging in age from 17-69, including seven players from the Hope in Handball junior handball program based in Harisburg, PA.
Stephen Cooney entered the event as a former RFC champion and the top seed, but would have to contend with Race 4 Eight stars Erik Torres, Ryan Bowler and Billy O’Donnell, as well as rising star Ivan Burgos and a number of other top players from the Northeast and Canada. Stephen Cooney cruised to the semifinals in the upper bracket, while Ivan Burgos continued to demonstrate his emerging skills in defeating R48 qualifier hopeful Matt Chu and R48 top 35 pro Billy O’Donnell en route to a semifinal clash with Cooney. Erik Torres cruised to the semifinals in the bottom bracket, while co-tournament director Mike Semplice played the best ball of his career in defeating Catriona Casey and Ryan Bowler en route to a semifinal showdown with Erik Torres. 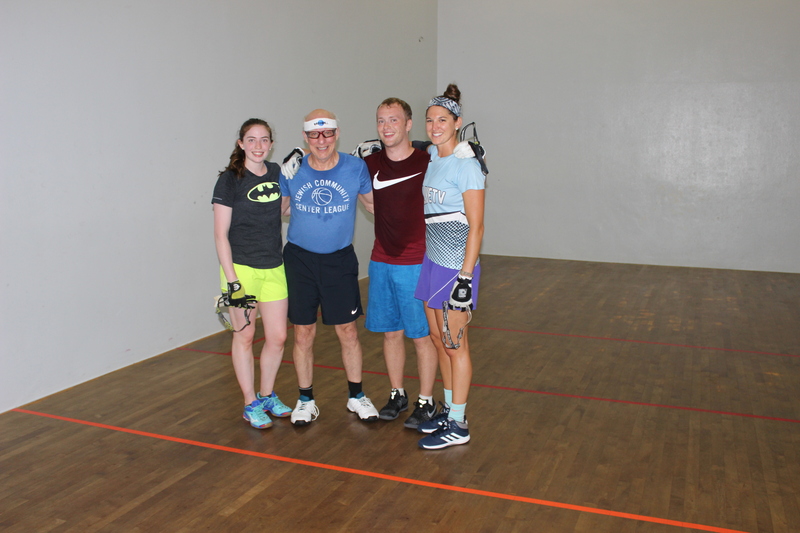 The 4-Wall mixed doubles featured 11 teams, with men’s and women’s pros teaming up, as well as pro players teaming up with Harisburg’s Hope in Handball’s teenagers. Tournament namesake Rodney Fink teamed with WR48 #1 Catriona Casey and advanced to the final with an impressive win against Team Semplice/Gawley, while Stephen Cooney and Suz Koehler were too strong for Ivan Burgos and Tracy Davis in the bottom bracket semifinal. Cooney and Koehler were dominant in the final, with Cooney continuing to hold his hot hand from the singles and future WR48 star Koehler keeping rallies alive and punching the ball to the ceiling to take the title. Billy O’Donnell entered the RFC’s 1-Wall small ball singles for the first time as the number one seed, based on more than a decade of success on the New York City 1-Wall small singles. O’Donnell showed his 1-Wall chops in the semifinal, defeating Arthur Sayed to advance to the final. In the bottom bracket, R48 top 20 pro Erik Torres was playing 1-Wall small ball for the first time but showed little signs of his inexperience, defeating New York’s two-time RFC 1-Wall small ball semifinalist Jason Ke in overtime to advance to the semifinal. The Olympic Club’s Torres would have an opportunity to avenge his 4-Wall loss to second-seeded Stephen Cooney on the outdoor cement. Cooney started well in the one game semifinal to 21, building a 10-4 lead. Torres found his groove, running off 10 consecutive points to take a 14-10 lead with blistering power and off-balance kills to take control of the match. Torres would maintain his lead and advance to the final in his first 1-Wall small ball start. Torres and O’Donnell played evenly throughout the first half of the final, but it was O’Donnell’s experience that pushed him over the line. O’Donnell pushed Torres off the court with deep hook serves and finished rallies with spike kills or paddle fly kills. With the victory, O’Donnell claimed his first RFC title. Always close to winning an RFC title in the 1-Wall small ball and 1-Wall big ball, Jason Ke finally earned his first RFC title in three years by winning the 1-Wall big ball singles. 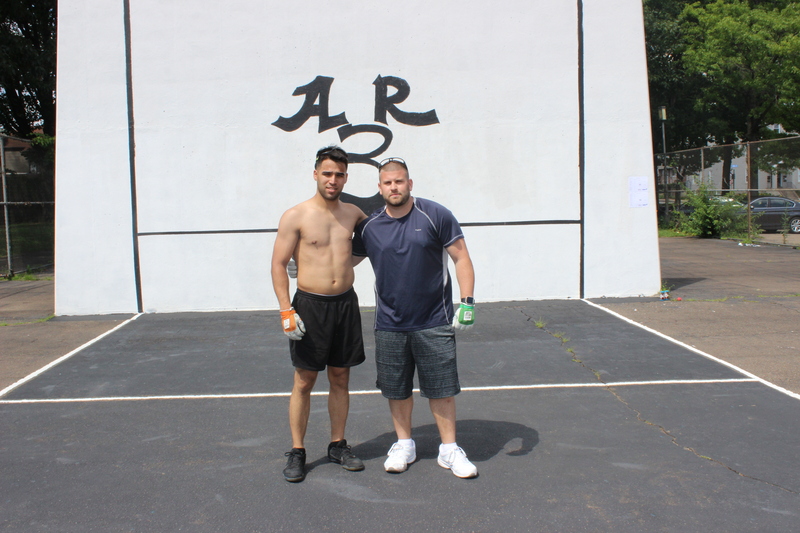 Ke ousted defending RFC 1-Wall big ball champion Arthur Sayed in a close semifinal and won another close match in the final against Billy O’Donnell. Ke’s game has been steadily improving over the past three years and look for him to be a major threat at RFC outdoor events in the future. The overall RFC Men’s Champion is determined by counting a player’s best two out of three singles events. 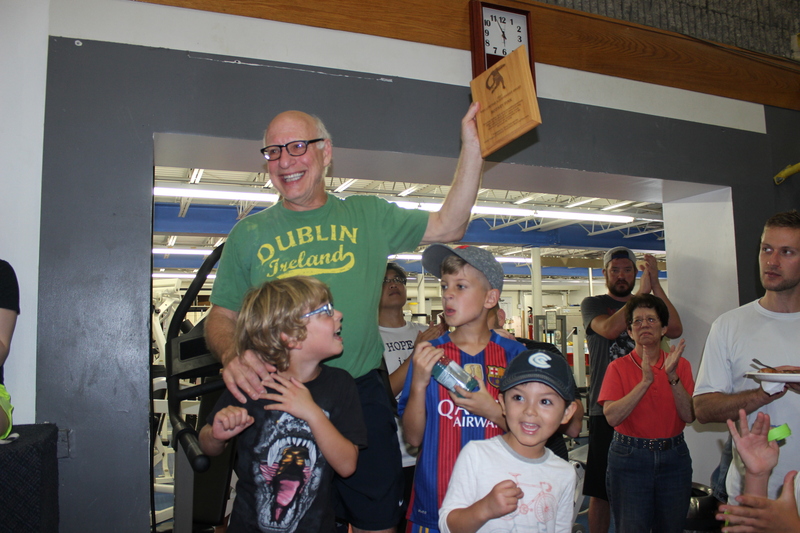 By winning the 1-Wall small ball singles and losing in the final of the 1-Wall big ball singles, Billy O’Donnell clinched the overall 2017 RFC title. 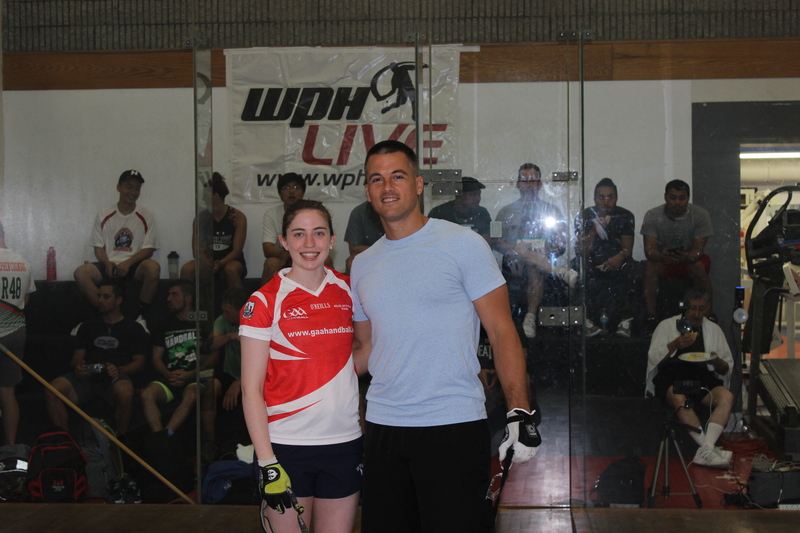 JR WPH proudly hosted one of the country’s most thriving junior handball programs at the 2017 RFC, as Harisburg’s Hope in Handball made the nearly four-hour drive across the state of PA to be a part of one of the country’s best events. 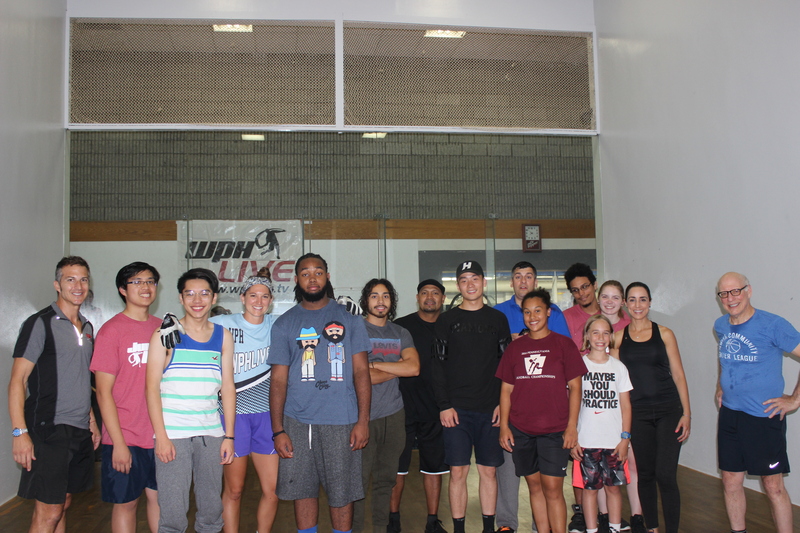 “We just love everything the WPH does and we are so happy to bring our kids to such a great event to watch the pros, learn, play and just be a part of it,” stated Hope in Handball’s founder and director David Botero. The 2017 RFC was the most successful in history because of the outstanding group of donors who made it all possible, Thank you to the WPH for continuing to support the event, all of the players for participating and joining/renewing their WPH memberships and to RFC Gold Donors Rodney Fink, Don and Patsy Mc Kinney, Mark Abranovic and Chuck Lucci. Special thanks to RFC co-tournament director Mike Semplice for allowing the RFC to be played at Amerift and providing endless hospitality. Thank you to Art and Louise Haffner for filming and streaming the RFC action all day on Saturday and Sunday on the Team Cleveland Facebook page! Thank you also to RFC committee member Matthieu Pelletier and his wife Nadia for allowing Team Canada to stay in their home. 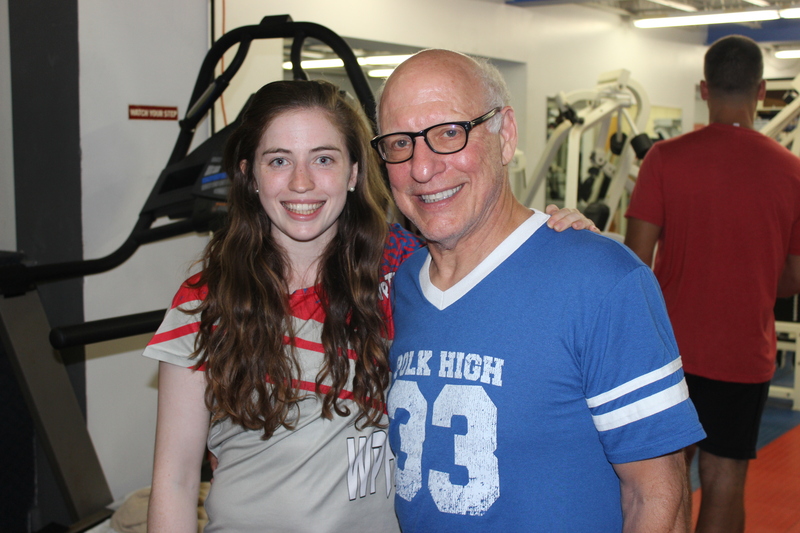 Because of the RFC’s generous donors, players enjoyed a special Friday night Victory Party, breakfast and lunch on Saturday and an incredible Saturday night BBQ. Wow!